An updated PARmed-X for Pregnancy form was quietly released by The Canadian Society of Exercsie Physiology (CSEP) late 2013. A big thanks to Dr. Michelle Mottola for her contribution to the process. The most notable difference between the 2003 form and the 2013 form is the new target heart rate chart for cardiovascular exercise during pregnancy. It now considers previous activity level and high BMI. The data is based on peak exercise tests in medically pre-screened low risk women who were pregnant (Mottola et al. 2006; Davenport et al. 2008). Something else you will notice is that it doesn't include women in their 40s. We asked the author, Dr. Michelle Mottola and she explained that this is due to lack of research on cardiovascular exercise with women in their 40s. This does not mean that women in their 40's should not exercise. If a pregnant woman in her 40s is healthy and has no pregnancy complications, her healthcare provider will likely encourage her to exercise regularly. 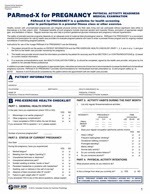 Download a copy of the new form here. Thanks so much; I wasn't aware it had changed! Neither did I?! I was on the CSEP website in early February and found it. It would have been great if there had been some sort of announcement but I assume it comes down to funding.